This Mother’s Day, many moms may enjoy a restful day off, including breakfast in bed, handmade cards and a hiatus from housework and sibling squabbles. But how do moms feel about their roles the other 364 days of the year? The answers vary depending on how old their kids are. Changing diapers and arranging play dates is a world apart from running the carpool and helping with college applications. And it’s true that moms of young children have different challenges than moms of teens. 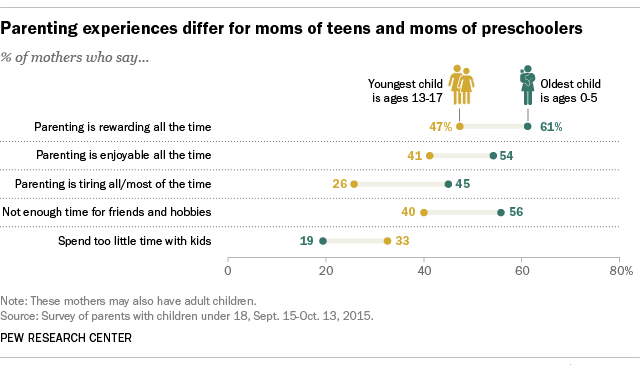 For example, compared with mothers of preschoolers, parenting is less tiring for moms with teens. Nearly half (45%) of moms whose kids are all younger than 6 say parenting is tiring all or most of the time, perhaps not surprising given that their ranks include sleep-deprived parents to newborns and infants. Just 26% of moms who have only teens say the same. There are differences between moms of preschoolers and teens when it comes to time with their kids, too. Moms of teens are more likely than moms of young kids to say they don’t spend enough time with their kids – 33% of moms of teens feel this way, compared with 19% of moms with only young kids. While the stereotype of the moody teen with the closed bedroom door may come to mind, other factors may also be at play – moms with older children are more likely to work outside the home, and older kids are more independent and spend more time out of the house, either at school or extracurricular activities. While they may not see their kids as much as they would like, moms with teens do have more time for themselves. Four-in-ten moms of teens say they don’t have enough time for friends or hobbies, compared with 56% of moms with only young kids. Overall, about nine-in-ten moms with children younger than 18 say being a parent is both rewarding and enjoyable for them all – or at least most – of the time. Moms whose kids are all ages 5 and younger are especially likely to say parenting is enjoyable all of the time – 54% do, compared with 41% of moms whose kids are all teens. Parents of young kids are also more likely to always find parenting rewarding – 61% say it is, compared with 47% of moms with only teens.